It's a true pleasure for me to answer your questions. This month, I grouped them into the theme of coins. So many ASI clients already own coins or have ownership on their mind, so I thought these client questions would have universal appeal for all of our readers. It's your questions that direct my focus in every Q & A. Keep them coming. A. ASI buys bullion coins and bars. In fact, it's a major part of our business. I am often shocked our clients don't know we buy. This is certainly a failing on our part, so I thank you. Your question gives me a chance to explain our simple process. After you ship your coins, send your representative (or myself) an email with the inventory of the package. Once the package arrives at IDS Delaware, it takes 24 hours to unpack, inspect and inventory your holdings. Then we will call you to lock in the price. If you do not like our offer after the evaluation, there is no charge. You only need to pay shipping and we will arrange to safely return your holdings. 3. hold the funds for you to make a future purchase. Finally, by Federal law, we are required to have your Social Security number on file when you sell. Just one more thought... If you want to sell rare coins, the process is slightly different. We will discuss your holdings up front and the best strategy for liquidation. No matter how rare the coin, ASI is the right place to sell any coin, every time, whether you purchased them through us or not. A. I have known Michael and Rich Checkan for a while now and I can tell you one thing about them and this company. When we recommend a new product of any kind, you are seeing the product of months (or years) of due diligence. If ASI is offering it, you can trust that we have done the vetting for you. If you choose to trade online through ASI Precious Metals Direct, you have built-in depositories. Simply choose which of the following locations you want to store your metals: New York City, Salt Lake City, Zurich, London, Melbourne or Singapore. These facilities are 100% insured for the value of your holdings, audited by a Big Four accounting firm on a periodic basis and run by some of the biggest names in the industry. Best of all, you can make your storage selections by smartphone, tablet or computer from anywhere in the world. If you already have precious metals stored at home or plan to buy through ASI or even another dealer (gasp! ), we have also vetted and worked with IDS of Delaware and IDS of Canada for years. These modern, secure, state-of-the-art facilities can free you from the worry of storing too many precious metals at home. Finally, our Perth Mint Certificate Program comes with FREE storage (unallocated gold and platinum) at the Perth Mint in Western Australia. With full insurance provided by Lloyds of London free of charge and the guarantee of the Government of Western Australia, Perth is a fantastic solution for precious metals held in or out of an IRA as a long term holding. At ASI, we encourage you to focus on the purpose of your precious metals ownership. Contact our Preferred Client Relations representatives to sort out which type of storage suits you best. Rare coins and numismatic coins are very different animals. I understand the confusion because so many numismatic coins appear to be rare by the 'scarcity' language used in most sales and marketing materials. For example, a popular numismatic coin, like the MS-65 Saint-Gaudens, have a total of 212,275 coins graded by PCGS and NGC. These coins can make great investments, if you buy right and from the right dealer. But, how rare are they if the one you buy is 1 of 212,000? While these coins are valuable, they are still affected by the everyday pressures of the precious metals market. Compare this to the $15,200 1808 $5.00 PCGS MS61, with only 60 coins available for trading. This design for half eagles was introduced in 1807 and it continued through 1812. 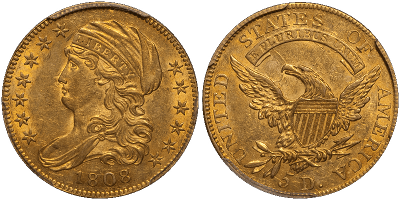 The half eagles of this era are all scarce, and this is a wonderful piece of early Americana, as nice quality early half eagles are not often available in today's market. There are 15 coins known in this grade and only 60 known grades according to PCGS. Rare coins are a different asset class. They do not act in lock step with precious metals. The marketplace value of rare coins is based on desirability to collectors. Beauty and history are an intangible of collector passion. Often collectors trade only among themselves, at specialized auctions, or with expert dealers like our rare coin expert, Douglas Winter. The coins are kept out of the sales process often until the collector passes away. ASI's Rare Coin Program (RCP) comes with the expertise of Doug Winter, the world's leading expert in pre-1933 rare U.S. gold coins. Doug is at the center of the rare coin universe, attending every major show and authoring 13 respected books on the subject of rare coins. He will hand-pick your portfolio and ASI can buy back your coins when it's time to sell. Doug will bring them to auction or engineer a private sale. To learn more, read our latest article, 'Take Refuge for Safety: Rare Gold Coins Your Asset Protection Power House,' by ASI Preferred Client Relations representative, Jon Swyers. Of course, we are delighted to talk with you about rare coins in your portfolio. Just call 877-340-0790 to speak with an ASI Preferred Client Relations representative. In sum, ASI wants to be your one stop shop for buying, selling and storing precious metals. But we recognize that such purchases need wise decision making and a guide by your side. In every Q & A, I let you how to meet up with our Founder, Michael Checkan, President, Rich Checkan, and other ASI staff members as they travel to conferences throughout the world. It's an opportunity to get their professional guidance. I am always available to meet you personally in the Washington, D.C. area. Just call me at 877-340-0790, and I will arrange to meet with you in our office, your office, or in front of the Lincoln Memorial. I'm usually easy to find - boots, hat and everything. ASI Meet Up: Where in the world is ASI traveling? Entrepreneurs, professionals, C-Suite Executives and business owners in varied business sectors meet up and make contacts with peers and colleagues in this intensive, one day event. The last three Stansberry events have been fantastic and Michael and Rich are looking forward to the 4th gathering in this series. You can be sure guests will be top-rate and, of course, find some time to meet with Michael and Rich while you are there. To inquire about the conference, please call 888-863-9356. The Jefferson Companies continue their string of strong conferences again in 2014. Alan Greenspan will be speaking at the conference in person, as the New Orleans Investment Conference celebrates its 40th year! Look for Rich on the precious metals panel discussion. Representatives from ASI, Stanley Gibbons, Ltd. and Douglas Winter Numismatics will be there to help you get the insider's track on exactly how investing in precious metals, rare coins, rare stamps and other collectibles is your next step in wealth preservation and portfolio protection. We'll show you how to protect what you own... keep it where it's safe... and the best strategies to make it grow.